For the seventeenth consecutive year, Santa Clara County Parks and South Bay Folks team up to bring you free, family-friendly concerts in support of Second Harvest Food Bank. 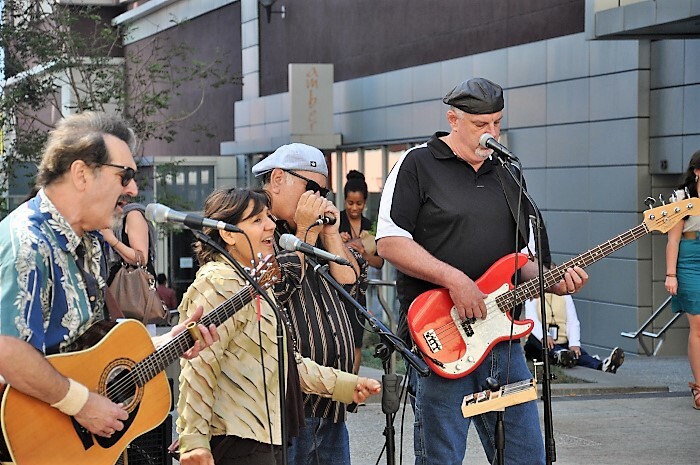 Located in a pleasant outdoor setting overlooking Vasona Lake and Los Gatos Creek, the Vasona Vibrations Concert Series features local artists performing a wide variety of acoustic genres from Americana to zydeco. Join us in the park this summer for Vasona Vibrations 2019. The Vasona Vibrations Concert series is always free. Food and cash donations for the Second Harvest Food Bank will be accepted at each concert. Learn more, or donate now. All performances held from 5pm-7pm on the lawn just down the hill from the pedestrian entrance at University Ave and Pepper Tree Lane. Lawn seating. Pack a picnic and bring a blanket or low lawn chair. Food and cash donations for the Second Harvest Food Bank will be accepted at each concert. Returning this year: Enjoy the a cappella harmonies of members of the Bay Area Showcase Chorus between sets at each concert. 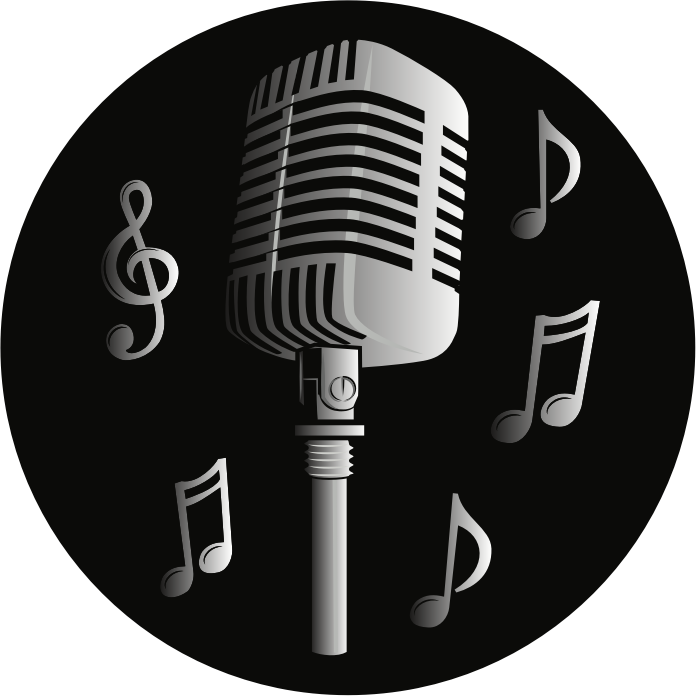 Bonus event: The Vasona Vibrations Acoustic Open Mike returns! 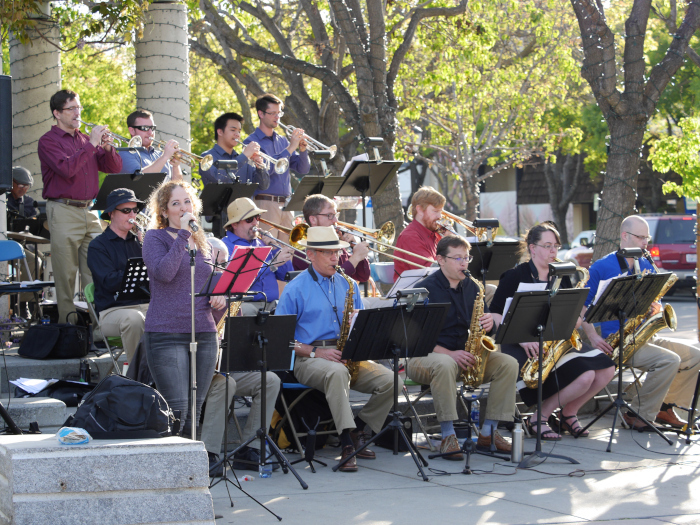 Top Shelf Big Band is a community jazz band from Sunnyvale, playing swing and jazz from the big band era. They are a volunteer organization dedicated to making the experience of live big band music available in the communities where we live and work. Nothing can replicate the excitement created by a live big band orchestra, reminiscent of an era of great live dance music and fun jazz. 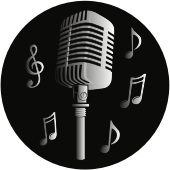 With great vocals and superb musicians, their music is perfect for dancers and jazz fans alike. Andy Ritger: alto 1; Rick Neely: alto 2; Robert Marr: bari; Bob Olson: tenor 1; Stephen Fernbach: tenor 2; Jason Loveman: bone 1; Bill Sommerfeld: bass bone; Alex Eagle: bone 2; Mark Rosenberg: bone 3; David Welsch: trumpet 2; John-David Mijares: trumpet 3; Idreece Barnes: trumpet 4; George Alfs: bass; Clifford Samoranos: guitar; Karen Stoneham: drums; Joe Samuels: piano; Adrianne Grady: vocals; Stan Grabowski: vocals. 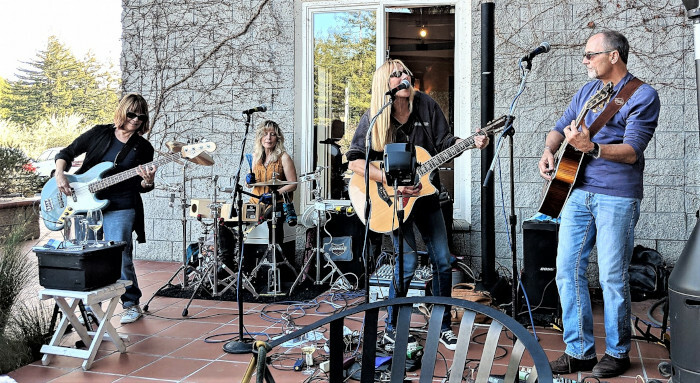 Blue House combines the talents of three longtime friends, Marlies de Veer, Amy Beasley and Brian Loud, who enjoy mixing a rocker's attitude with an acoustic sound, highlighted by their close-knit harmonies. They cover a sometimes mind-boggling eclectic mix of songs with an emphasis on FUN. They are joined by their good friend, Shelley Hoefer, on percussion/drums. The high-octane Americana band, The Jones Gang, is like a VW van with 310,000 miles rolling out of the shop. They are, still truckin', with some new tunes and grooves. Travis Jones, the Soul Mountain, is the lead singer with a voice for the ages. Henry Salvia, the Motor City Misfit, plays more notes than exist on the piano. Josh Zucker is the strong and solid base and bass of the band, and Peter Tucker is, of course, the best Peter-Tucker-style drummer in the world, and the only drummer officially approved by the Northern California Bluegrass society. Sean Allen, Master of The Telecaster and on lap steel guitar is fun to listen to and watch! The band can move seamlessly from a murder ballad to a New Orleans rhumba, first breaking your heart and then making you glad you're alive. Grammy-nominated Andre Thierry was born and raised in Northern California, but his French Creole heritage is deeply rooted in Louisiana. He grew up with the French Creole ("la-la") dances that his grandparents held at their church parish, St. Mark's Catholic Church. The best zydeco musicians Louisiana had to offer would travel to California to play at these dances. It was that exposure which led to his love for traditional French Creole music. By age twelve, Andre had formed his own band, "Zydeco Magic". Self-taught, Andre's repertoire grew by leaps and bounds as he was regularly invited to play with visiting bands, such as the late John Delafose and many local Zydeco and Cajun bands. "A master at pumping out fast, funky rhythms on an instrument not usually associated with earthy syncopation. 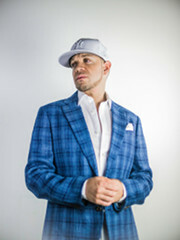 A versatile student of the music, Thierry can't be lumped into Zydeco's old-school R&B-influenced camp or its nouveau, rap-inspired one: He and his band, lay down both soulful, traditional slow-dances and bottom-end-booming kinetic grooves." Windy Hill is keeper of the bluegrass flame on the West Coast. 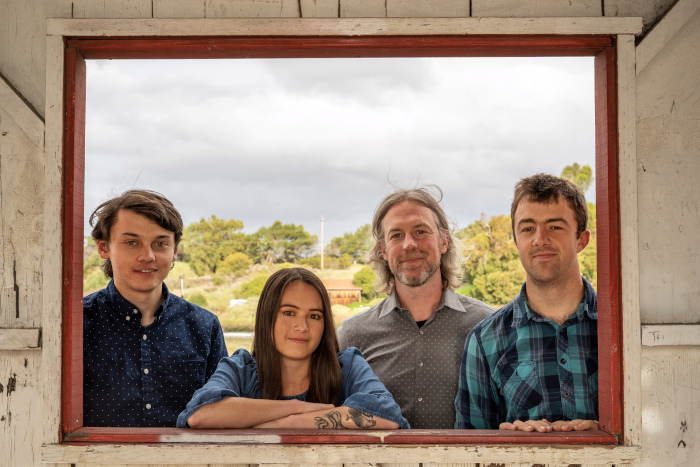 Formed over ten years ago by Portola Valley's own banjo man, Ryan Breen, Windy Hill has covered a lot of ground in the last decade, performing "Live from the Ratz Nest," released in June 2018. While the band is steeped in the traditional style, they've cultivated their own distinct bluegrass sound. The balance between their love for classic bluegrass and keenness for exploring fresh musical ideas defines their style and approach, and makes them a fan-favorite for music lovers of all types. Three-part harmony, lonesome duets, banjo breakdowns, honky-tonk sorrow, blues mandolin, and original material all combine to create their vision for bluegrass music and its future. They've won numerous awards, performed at festivals, venues, and bars across the west coast, and released four albums: "Live from The Ratz Nest" (2018), "Bluegrass Sounds from California" (2017), "The Lonesome Garbage Man" (2013), and "Let's Go To The Fair" (2011). Original and current members of Blue Summit, AJ, Sully, and Jesse, became friends and musical companions many years ago while attending bluegrass festivals around California. Three years ago they formed Blue Summit with their friend Isaac Cornelius. A year ago, they welcomed their current bass player Chad Bowen into the group, a well-seasoned bass player, musician, and a great guy. The year-old quartet has had a busy year of recording, writing, and touring around California, the UK, Ireland, France, Oregon, and Southern California. While Blue Summit is deeply rooted in the bluegrass world, they explore many other genres while still maintaining a sound that is honest, exciting, and alive. 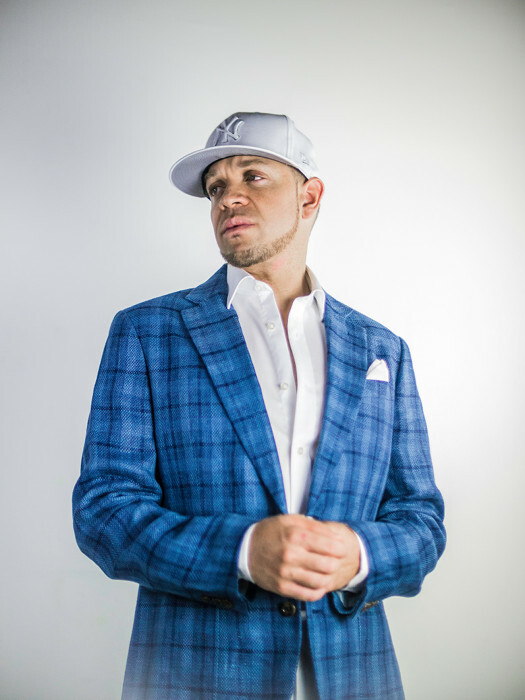 Headed by songwriter and award-winning vocalist AJ Lee, Blue Summit combines the traditional with the new to create a dynamic and unforgettable experience. 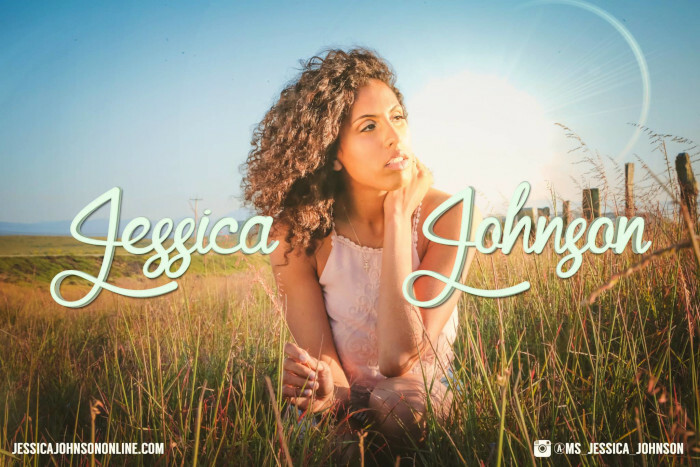 Vocalist Jessica Johnson has had a love of music for as long as she can remember. As an adolescent, Jessica started singing the national anthem for the SJ Sharks, which parlayed into singing the anthem for every notable professional sports organization on the West Coast. She has been featured several times at the San Jose Jazz Festival, and today she performs at countless venues up and down the West Coast. 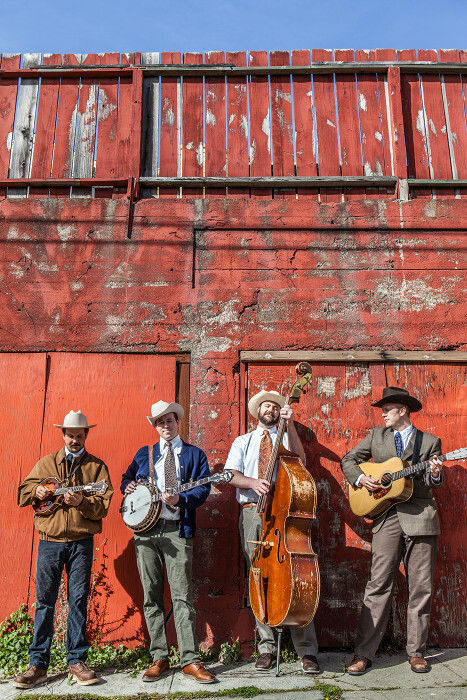 Bean Creek plays straight-ahead, traditional-style bluegrass. 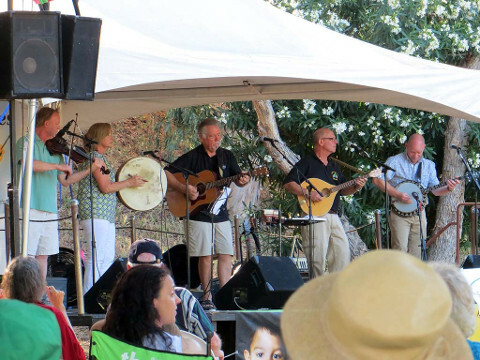 This band was voted Best Band for two years in a row by the Northern California Bluegrass Society and has also captured Best Vocalist, Best Banjo Player, and Best Mandolin Player awards. 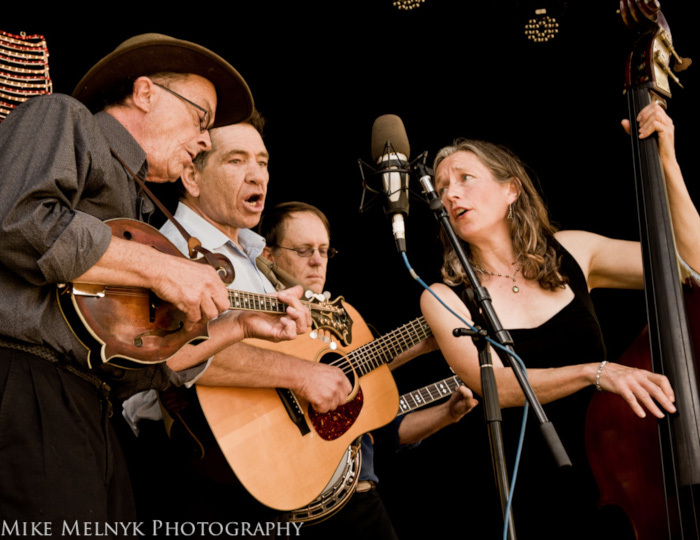 Vocal harmonies and fine pickin' places Bean Creek in the top echelon of the California traditional bluegrass scene. The Vasona Vibrations Acoustic Open Mike returns again this year, and is open to all acoustic musicians, singers and songwriters. Sign up by 3:45pm. Performers will be selected by lottery for 18 time slots. Performers pick a time slot as their names are drawn from a jar. No advance reservations. Performers must be present at the time of the drawing. Performers are limited to two songs or 10 minutes (including setup time), whichever comes first. Maps and specific driving instructions are available from Google Maps.